This phrase came to my mind when I reflected on St Thomas Aquinas (1226-1274), an ever-shining star of Catholic thought and, therefore, a patrimony of all humanity. Until not long ago, being a Thomist was a sure sign of being a Catholic who followed orthodoxy, what is right to believe, rather than orthopraxis, a vague “to behave well” (but according to what?) But orthopraxis has no meaning if deprived of orthodoxy, because my behavior will not be correct if it is not correctly guided. The thought of our humble Dominican friar, Thomism, has guaranteed a shelter from the drift of the intelligence that craved the celebration of itself (the French Marcel de Corte should be re-read for a healthy development of this concept) guaranteeing a return to the truth of the things. It is said that at the beginning of his lectures St Thomas showed an apple to his attendees and stated: “This is an apple. If you do not agree, you can leave.” What did it mean? It meant and it means that there can be no discourse that does not start from accepting the truth of things for what they are. In the wake of a not only Christian tradition of thought, he defined truth as adaequatio rei et intellectus, that is the intellect that adapts to the truth of things. This healthy realism protects us from practicing a religion that is based on the contortions of the intellect on itself, it allows us to say true things because they are true in themselves, not because we say them. We were talking about the realism of St Thomas: “It is thanks to his realism that he opens the way that leads to faith in the conquest of those reasons of credibility that make it the most careful and happy overcoming of reason …” (E. Zoffoli, op cit.). Thomas keeps us anchored to the world precisely in order to overcome it in a higher synthesis and teaches us that Christianity does not reject reality, as was typical of some heretical tendencies within Christianity itself or as it is characteristic of some Eastern religions, but penetrates it. He understands and accepts, and only after this does he reach beyond it for a greater Reality. A Thomist as profound as Antonio Livi sees Thomism in this way: “Aquinas, apart from the greatness and originality of his speculation, is also the author of a theoretical synthesis in which figure Plato, Aristotle, Neoplatonism, Patristic thought, Arab and Jewish philosophy: Thomistic philosophy can therefore easily lend itself to a discourse of confrontation and connection between ancient and medieval thought, and then between the medieval and the modern. A characteristic of Thomistic philosophy is the perfect coherence of typical gnoseological elements of empiricism with those that would seem to characterize intellectualism. In reality, it must always be remembered that St Thomas has constant attention to the unity of the system of truth, of experience, which means unity between sensible perception and intellectual knowledge, between the prima operatio intellectus and judgment, between intellectus and ratio: unity, certainly, in the distinction, which is analytically specified by Thomist gnoseology, but never reaches the point to attribute autonomous value to one of the individual moments of knowledge” (2007 Senso comune e logica aletica). Unfortunately it is not rare today to see a rejection of Thomism even in venerable religious congregations in the name of adherence to a modern thought that is not only a departure from Thomism but, perhaps because of this distancing, even a rejection of the natural progression of reason. Saint Pius X stated in Pascendi (1907) that a clear indication of the advance of modernism is in the rejection of scholasticism, hence of the thought of Thomas who is the heart of it. But all those who have at heart the use of reason should have recourse to Thomism. A Thomist like Cardinal Dino Staffa could say: “Thomist philosophy, although prescribed by the Church, does not cease to be philosophy, that is, an exclusive work of reason. The authority that imposes it does not intend to replace the demonstration and the intrinsic evidence of its conclusions” (1989 Il Tomismo è vivo). 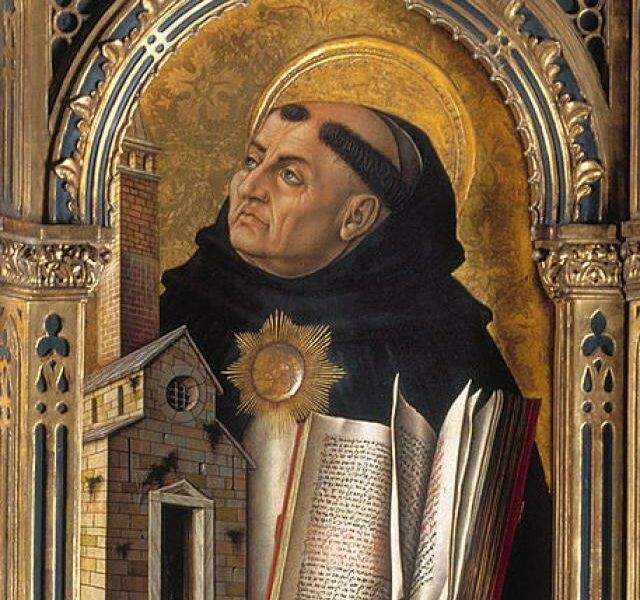 In short, St Thomas Aquinas belongs to humanity precisely because he starts from the factual data of reality.